Facebook’s IPO – Is it really worth buying a share? F acebook is set to go public sometime in May, as a publicly traded company that is. Currently the company is raising its IPO or Initial Public Offering of $5 billion dollars with the help of several big named banks. The IPO is essentially a piece of the company that Facebook is willing to put out and sell to investors for a large chunk of money to use on growing its business, or maybe just making its current investors even richer than they already are. The IPO is usually based on the value of the company along with other factors decided by the company and the banks involved. 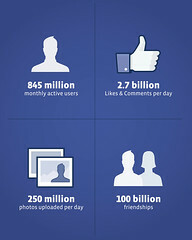 While no one can really say how much Facebook is actually worth, many estimates range from 80 to 100 billion dollars. This would mean that the $5 billion IPO is actually a pretty small number, and many thought it would be closer to $10 billion. However Facebook is playing it safe and being conservative, which will only help. If you’re looking forward to buying Facebook shares be prepared to wait a long time. The banks that supply the money for that IPO give their clients the first access to the shares, and usually those first few in the 1% take up 90% of those shares (take a number 99%).